We love this fun and quirky bead from the Thomas Sabo Karma beads collection. 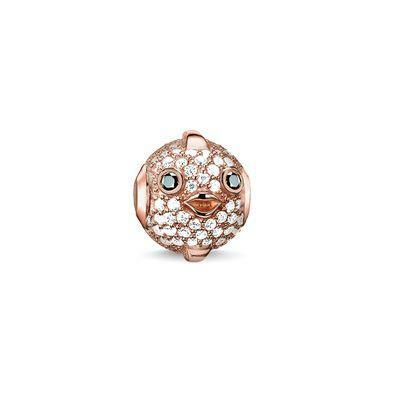 Made from Sterling Silver and plated with 18k Gold adorned with Cubic Zirconia stones, we love the cute eyes and lips! The glittering scales of the Pufferfish protect it from danger, wear your Pufferfish to ward off bad luck and negative energy. The Karma collection from Thomas Sabo is an exciting new way to express your personal style with a collection of Karma beads that are as diverse as life itself. The Karma collection promotes positive energy, allowing you to express your personal style and thoughts through your jewellery collection. Add beads to bracelets, necklaces or earrings to express your Karma bringing joie de vivre and good fortune to your life.